Under Turkey's authoritarian President Recep Tayyip Erdogan, the word "terrorist" has become synonymous with opposition to his regime. Erdogan even recently called parliamentarians from Turkey's largest legal Kurdish party "terrorists." 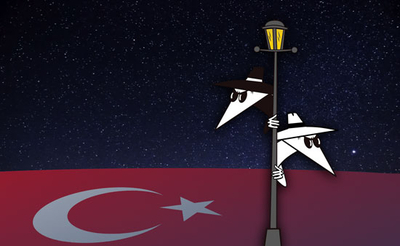 An IPT source obtained the document using Turkey's National Judiciary Informatics System (UYAP), which is accessible only to people authorized by the Turkish Justice Ministry. Its title page bears the stamp of Hasan Yilmaz, the same prosecutor who investigated the murder and disappearance of Washington Post columnist Jamal Khashoggi. "The language and the sources used in the document (Turkish version) makes it clear to me that this is a government document by a prosecutor's office in Istanbul," A.Kadir Yildirim, a fellow for the Middle East at Rice University's Baker Institute, told the IPT after reviewing it. 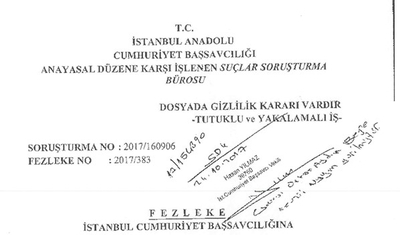 This document suggests that Turkey's New York consulate sought information from human sources about a Balkan American organization, attempting to link it with the Gülen movement – which the Turkish government calls the Fethullahist Terrorist Organization (FETO). The FBI interviewed several prominent Turkish-American activists in 2016 on suspicion they were involved in political espionage on Erdogan's behalf, an email to the Turkish president's son-in-law Berat Albayrak showed. "Our relevant units and institutions will continue their operations in the countries in which FETO operates, whether it be the U.S. or some other country. Rest assured that they will feel Turkey breathing down their necks," Erdogan spokesman Ibrahim Kalin said last September. He mentioned Kosovo as an example, where Turkish agents kidnapped Gülen followers and brought them back to Turkey for trial. "You, who are in Pennsylvania, will also come," Erdogan vowed in April 2018 in reference to Gülen. Turkey's slide toward dictatorship has encouraged the use of evidence gathered by Turkish spies abroad in prosecutions, experts say. "The nature of dictatorships is that evidence is really secondary to a pre-determined verdict but, in this case, it shows Erdogan's sense of impunity," said American Enterprise Institute (AEI) Turkey scholar Michael Rubin. "Alas, a decade of diplomatic reticence to condemn Erdogan for his behavior and to put lipstick on the Turkish pig has emboldened the Turkish leader. He's taking a page out of the playbook of Iran, Saddam's Iraq and Gaddaffi's Libya." Former Turkish National Police counterterrorism official Ahmet Yayla told the IPT that he saw foreign intelligence used as evidence by Turkish prosecutors. These indictments were based on intelligence because proper evidence is lacking, he said. Yayla, an assistant professor at DeSales University in Pennsylvania focusing on security and terrorism, left Turkey in 2015 because he was angry with Erdogan's support for ISIS. Thousands of people accused of being Gülenists have been arrested, including hundreds of journalists. Not everyone accused of being a Gülenist is one. Now Erdogan's vendetta against Gülen and his supporters appears to have reached American soil, the document shows. "Although there is no information that can be used as an indication for direct association with FETÖ/PDY [Gülen movement] affiliated organizations in open sources, it is observed that some of the sponsors and partners of TUSKON's [The Turkish Confederation of Businessmen and Industrialists] activities are FETÖ/PDY affiliated organizations and this connection is confirmed by the sources that are in contact with the Consulate General of New York," the document said. This use of the word "sources" indicates that the consulate relied on human intelligence to obtain the information, Yildirim said. Intelligence gathered by these "sources" was later used in a criminal indictment that charged critics in Turkey with terrorism. Yildirim said the extent of Turkish intelligence gathering on perceived foes in the United States is unknown, but: "Given the general political context of the last several years, it is perfectly reasonable to assume that such practice has become common practice. I believe a similar operation is underway in Europe where there is a larger Turkish national population." "Considering that [the] Erdogan government goes after critics' relatives and family members including children with blatant abuse of criminal justice system, such profiling and espionage activities abroad have far-reaching repercussion[s] back in Turkey," said Abdullah Bozkurt, former editor of the Turkish newspaper Today's Zaman. Erdogan has shown a disregard for diplomatic protocol in the past. His bodyguards beat up Kurdish and Armenian protesters outside the Turkish ambassador's residence during a May 2017 visit to Washington, D.C.. The pro-government Hurriyet Daily News reported in 2016 that Turkey's Ministry of Religious Affairs, the Diyanet, conducts surveillance on dissident Gülenists in 38 countries including Switzerland, The Netherlands, Germany, Norway and Austria. This has caused concern that the Diyanet Center mosque in Lanham, Md., could be used for the same activity. Both TASC and MUSIAD USA have lobbied Congress on behalf of Turkish interests. This includes lobbying on aid to the Kurds a year ago and against President Trump's sanctions against Turkey last summer. Neither has filed a FARA registration. "[The FBI agents] asked about MUSIAD and TASC," former MUSIAD USA Executive Director Ibrahim Uyar said in a 2016 email to Erdogan's son-in-law Berat Albayrak. "They are accusing me of trying to intervene in American politics on behalf of our President and making secret agents in the name of the Republic of Turkey. They have studied our work in the last two years and they have questions because of the report they received," Uyar wrote. Uyar traveled to Africa with Erdogan last summer and now coordinates the activities of MUSIAD's branches worldwide. "There is ample evidence that Turkey, through its proxies, is conducting illegal espionage on U.S. soil, especially with regards to Gülenists, Kurds, and political dissidents," Rubin said. " The Trump administration should expel Turkish diplomats in protest, he said. Erdogan can't retaliate without l hurting his economy, which already is teetering. "Allies do not conduct this sort of espionage on U.S. soil. There has to be consequence for such action," Rubin said. "It's time to end the fiction that certain foundations and organizations aren't anything more than Turkish proxies. If Erdogan is using such groups to bypass FARA or conduct illegal espionage, it's time that their principles face all penalties under the law, including for espionage."